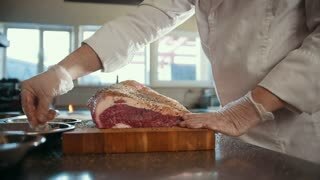 Butcher Cutting Pork Meat in Meat Factory. Fresh raw pork chops in meat factory. 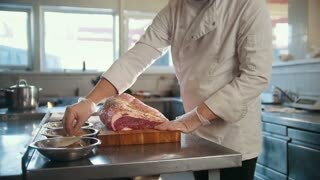 Meat processing in food industry. 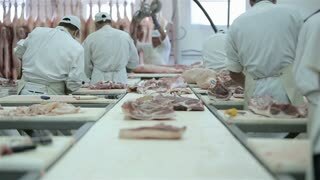 Production line in meat processing plant. Butcher cutting fresh meat at pork factory. The meat processing industry. Butcher at work. Butcher at a meat factory cutting pork meat. 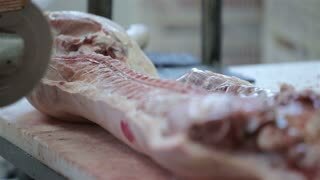 Fresh raw pork carcass on table. 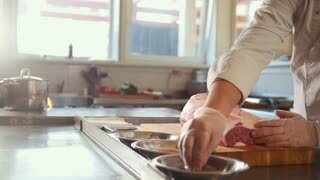 Meat processing in food industry. Whole carcass of fresh raw pork on wooden table. 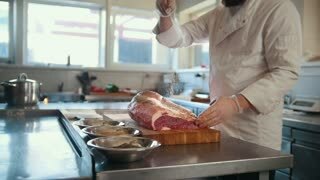 Butcher cutting raw pork at meat factory. Pork meat processing rules.